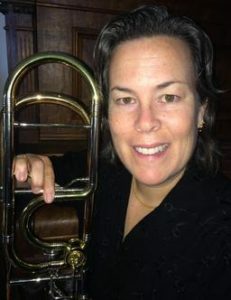 Lori Stuntz is a freelance trombonist in the greater Los Angeles area. She has a Doctor of Musical Arts degree from the USC Thornton School of Music, where she also received her Master of Music. She received a Bachelor of Music degree from San Jose State University. Lori plays principal trombone with the Los Angeles Jewish Symphony, trombone with the San Bernardino Symphony Orchestra, and frequently performs with many orchestras including the Santa Barbara Symphony, Riverside Philharmonic, and Symphony Silicon Valley. Dr. Stuntz is on the faculty at Cal Poly Pomona, Mount San Antonio College, and Los Angeles City College. As a commercial player, Lori plays lead trombone for the all female big band Maiden Voyage and has performed with artists such as DIVA, Nancy Wilson, Jack Sheldon, Diane Schuur, Ray Anthony, Lionel Hampton, Bill Watrous, and The New York Pops. Her international performances include concerts in Germany, Japan, Austria, France, Mexico, and the Caribbean. As a recording artist she has appeared on many major motion picture soundtracks, commercials, video games, and records including Alice in Wonderland, Superman Returns, and X-men 3. She is the first female trombonist to record on a major motion picture.